Following the exhilarating action-based setup in ‘Deimos,’ Lord Slaadek’s plans to revive the honourable and ancient Ice Warrior civilisation at the expense of humanity are close to coming to fruition. But as the Doctor confronts his own morality regarding the importance of an individual life as the resurrection of Mars nears, an even older enemy than the Ice Warriors emerges to truly test the Doctor’s heroism as friends become enemies and vice versa. ‘Deimos’ made the surprising choice of treating the Ice Warriors as more of a generic villainous group, playing up their physical threat and relation to Mars more than the honour that makes them so distinct. However, with the action rolling along at such a steady clip, that choice served the story admirably. 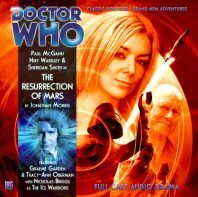 To an extent, that is repeated here in ‘The Resurrection of Mars,’ the Ice Warriors always posinga genuine threat around which to base the narrative but pushed further into the background as the Monk and Lucie Miller once more firmly enter the picture and the Doctor’s sense of morality is thrust squarely into the spotlight. With Lucie channeling the Doctor’s sense of righteousness and morality and thus clashing with the Monk over his course of actions since the two were last seen in ‘The Book of Kells,’ the Monk has chosen to abandon her upon the Deimos base. This creates a very personal dilemma for the Doctor as suddenly his seeming willingness to detonate a bomb that would destroy all of the Ice Warriors comes with a very intimate consequence once her life signs are detected. With the debate of the importance of one life against the many circling around him and everyone more than willing to chastise him for the importance he places on Lucie’s life as the thousands of colonists remain in mortal peril with the Ice Warriors still alive, ‘The Resurrection of Mars’ is certainly willing to discuss the implications of this decision and justifies both sides of the argument, ultimately leading to fantastic scenes of confrontation as well as introspection once the Doctor compares the motives of his eighth incarnation compared to his seventh. It does seem a bit out of character for the Doctor to so easily the dismiss the fate of the colonists aboard the shuttle that perished at the hands of the Ice Warriors as well as the ultimate fate of the planet Halcyon because those were events that were going to happen regardless of his interference, but the overall moral drama on display is easily some of the strongest that Doctor Who has offered in some time. This is only exemplified further by the presence of Graeme Garden’s Monk who offers an effective alternative to the Doctor, a figure who is willing to justify the means in order to bring about an end with which he is satisfied. The Monk is adept at manipulating events and emotions and knows exactly what to say to Tamsin to shatter whatever remaining faith she has in the Doctor after his decision to save Lucie at the expense of others. The scenes between Garden and Niky Wardley are powerful and believable, with both actors rising to the occasion wonderfully. And although Lucie seems to forgive the Doctor a little too quickly for the events that caused her to leave initially in ‘Death in Blackpool,’ the same is absolutely true for both Paul McGann and Sheridan Smith. ‘The Resurrection of Mars’ is surprising in many respects, but the strong work from everyone involved on both sides of the microphone as well as the decision to turn away both from an overt Ice Warrior menace as well as the pacey action that pervaded ‘Deimos’ result in an extraordinarily thought-provoking release that once more changes the trajectory of the series going forward.